Little monkey is in to everything these days. And by “in”, I literally mean it. One of his new favourite things to do is play hide and seek. Mostly these bouts begin when he realizes I am putting him to bed and he playfully, albeit not that quietly, goes and hides behind his rocking chair, leaving me to see just one little shining and mischievous eye peeking in and out from the behind the chair. A clear sign that he’s hiding (besides me actually seeing him scurry to his hiding place) is when things go quiet. You know quiet – that sound of silence that used to grace us quite frequently in the time before kids? But in this case quiet doesn’t actually mean silent, just quieter than usual, because if you listen carefully you can hear the accelerated and whispered breathing of an excited Niko, whose feet are sticking out from under the moving curtain, or whatever the “secret” spot of the minute might be. 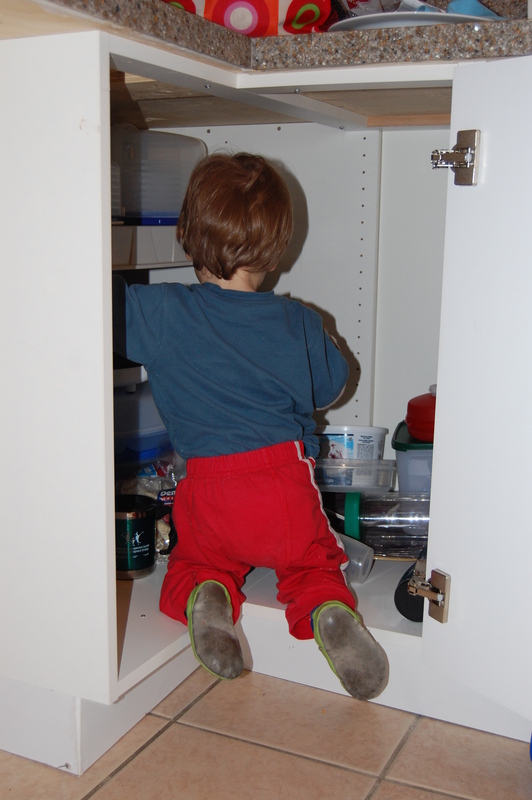 The other day Borys was put into a mild state of panic (having a toddler around can just do that!) when Niko seemed to be playing underfoot one minute, but had quietly disappeared the next. Now seeing as they were in our house, and our house has baby security gates at all the major “danger” spots, the little guy couldn’t have travelled too far. But Borys was left wondering where the heck he was when a quick search of the living room, dining room and kitchen revealed nothing. So Daddy’s left searching, and by searching I mean mostly just standing around in one spot wondering “What the heck? 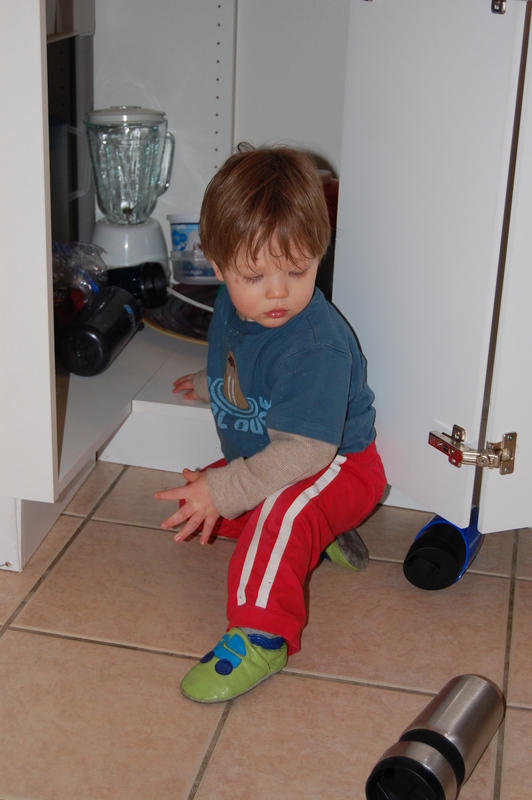 !”, when he hears the telltale signs of quiet toddler giggles. Just muffled ones, seeing as Niko was trying to contain himself but falling short of being completely quiet. 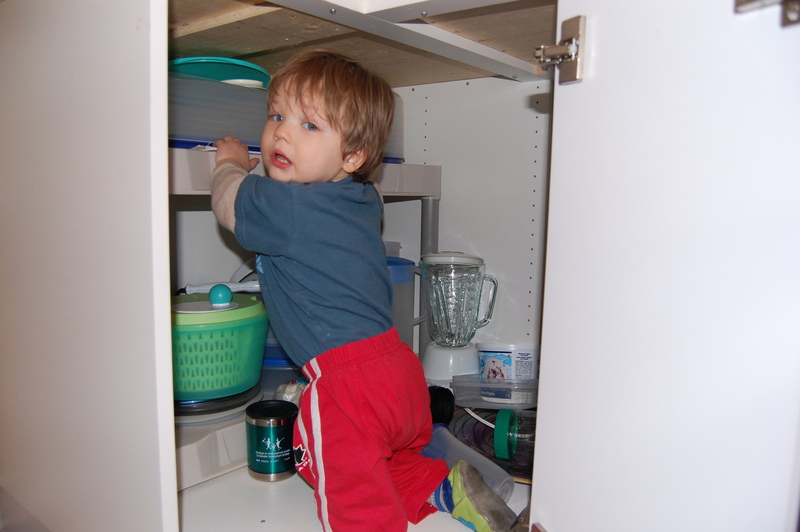 It was then that Borys opened the cupboard door only to find one year old N bomb happily squished in amongst the Tupperware and smiling all the while. 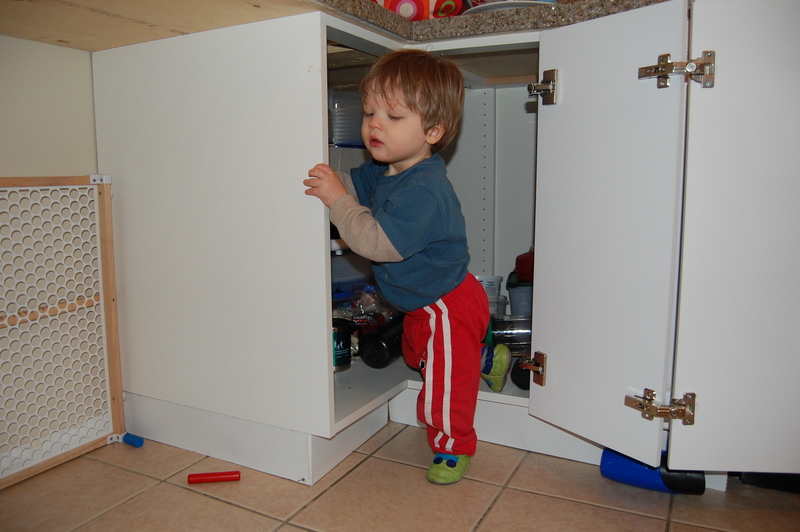 As seen in the pics below, this cupboard has become a favourite “go-to” place for our tiny rebel. He especially loves putting one Nalgene bottle over each hand and then banging them together – a makeshift musical instrument of sorts. What fun.